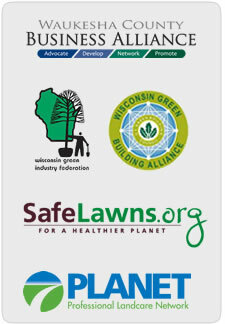 Organic lawn care products provide a sustainable and natural approach to lawn care. Our program focuses on providing the ultimate in quality while creating a healthy environment for your business or family. We are committed to creating partnerships with organizations that share our dedication in creating sustainable environments. Even with the best care available, lawns and athletic fields thin out and lose color. Over time, grass like any other living thing, will eventually die. Overseeding will thicken a lawn and crowd out weeds. It will introduce the newest, more hardy varieties to your lawn to make it less susceptible to drought, disease and insects. Topdressing with compost furnishes beneficial micro-organisms and nutrients that are safe for the environment. Compost adds vital organic matter to your lawn and increases your lawns capacity to hold water. The Lawn Works has partnered with White Oak Farm Premium Organics, the supplier of “Purple Cow” Organics Activated Compost with Microlife. This scientifically formulated, tested and certified premium compost delivers a full range of benefits, along with metabolic building blocks to enrich and enliven your soils food web. Selected foodstocks, smaller screen size and additional curing, produce a superior product for the sports field manager. Compost tea returns the biology to the soil. We can add other amendments such as molasses, kelp and fish oil to create a balanced microbial population. This biology improves soil structure and makes nutrients available to the plant. © 2014 The Lawn Works. All rights reserved.